If you need to restore password for MS Outlook email accounts, CrackPDF Outlook Password Recovery will be a good helper for you. 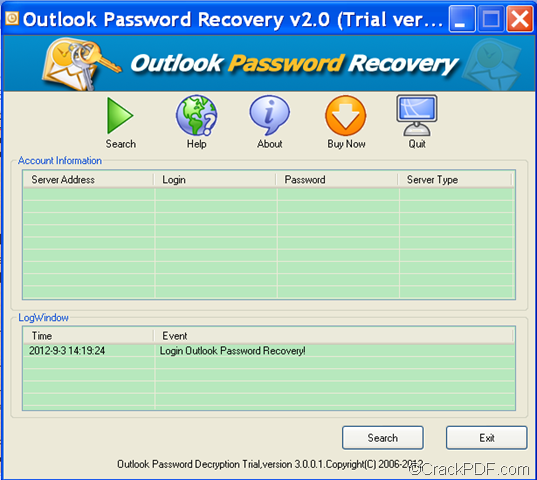 CrackPDF Outlook Password Recovery is a smart Windows application that can recover password for Outlook email accounts. It can also recover Outlook email account name, server name, and server address. It supports all versions of Microsoft Outlook such as Outlook 1997, 2000, 2003, 2007, and 2010. Microsoft Outlook is a personal information manager from Microsoft, which is available as a part of the Microsoft Office suite. It is mainly used mainly as an email application. But it also includes a calendar, task manager, contact manager, note taking, a journal and web browsing. How to restore Outlook email password? Firstly, please click the following link to download the free trial version. Free download CrackPDF Outlook Password Recovery. After downloading, please double click the installer and follow the setup wizard to install it on the computer. When opening the application, you can see its user interface on the screen. Secondly, please click the Search button in the tool bar or click the Search button at bottom of the interface to start to restore the password, email account name, etc. for the Outlook email accounts. When the application finishes the recovery of the Outlook password, it will display all the Outlook email accounts information such as server address, account name, retrieved password, and server type in the “Account Information” table list. In the “LogWindow” table list, it will also display the time of the process and event. You can see it in the following snapshot. As you can see from the above contents, it is so convenient and easy to use CrackPDF Outlook Password Recovery to recover Outlook password. If you are still trapped in the problem of restoring Outlook password, please feel free to try this application via clicking the following button. This article is mainly about how to recover forgotten password and account name for Microsoft Outlook email with CrackPDF Outlook Password Recovery. 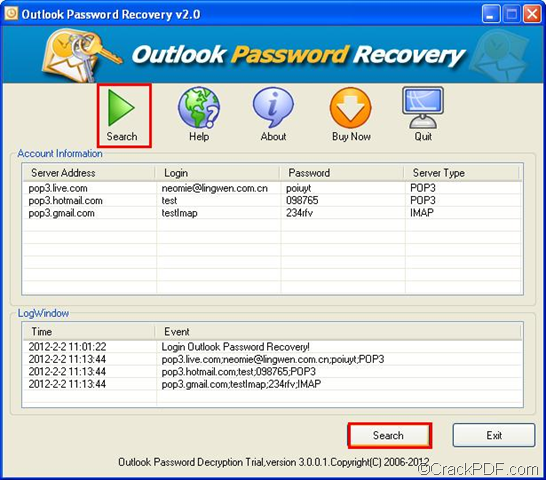 CrackPDF Outlook Password Recovery is an easy-to-use Outlook email data recovery tool that can retrieve forgotten or lost Outlook password and account name. It can recover account data from all versions of Microsoft Outlook such as Outlook 1997, 2000, 2003, 2007, and 2010. Follow the steps below, you will find back the account information of your Outlook emails as soon as possible. Download the installer of CrackPDF Outlook Password Recovery. Then, install the app by double clicking the .exe file and following the setup wizard. By default, the application will be automatically launched if you have successfully installed it on your computer. Step 2. Recover the account name and passwords of Outlook email. Click one of the Search buttons as shown in the following snapshot. 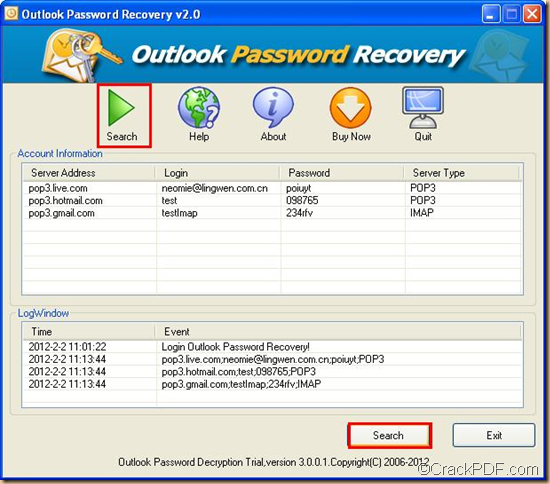 Then, CrackPDF Outlook Password Recovery will automatically search the account name and passwords information of Outlook email. When the recovery is done, you can find the Outlook email account name in the “Login” column of the “Account Information” table and the Outlook email password in the “Password” column of the “Account Information” table. You can also see the server address and server type in the “Account Information” table. In the “LogWindow” part, it will display the time and event. 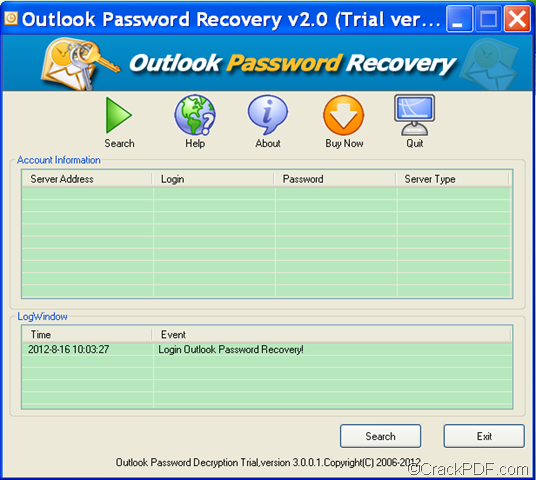 With CrackPDF Outlook Password Recovery, you just need to click one button to recover Outlook password and account name. CrackPDF Outlook Password Recovery can be tried for free. You can have a try by yourself! Click the download button below to get the trial version of CrackPDF Outlook Password Recovery: . 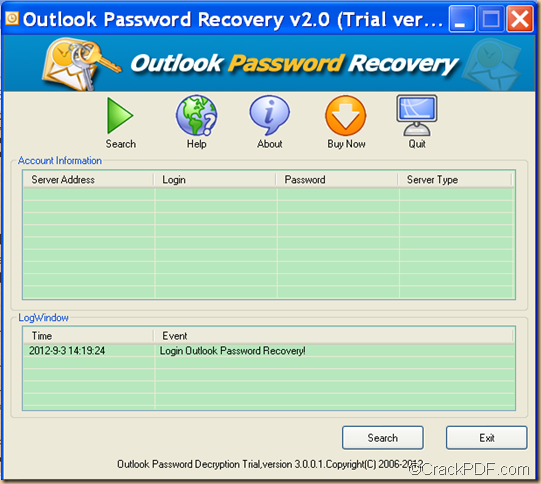 How to recover password for MS Outlook email accounts? Lost password for Microsoft Outlook email accounts? Don’t worry! 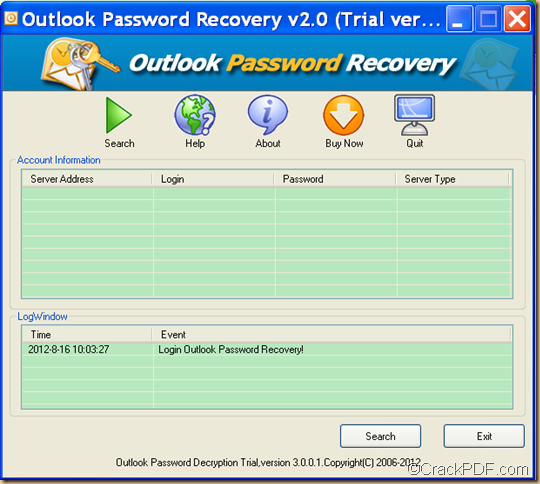 CrackPDF Outlook Password Recovery can help you easily recovers the lost Outlook email password. CrackPDF Outlook Password Recovery is a professional and useful tool that can effectively restore forgotten password for email accounts in MS Outlook 1997, 2000, 2003, 2007, and 2010. No matter how complex and long the password is, the software can instantly recover Outlook password. What’s more, CrackPDF Outlook Password Recovery is extremely easy to use. The only thing you need to do is to click one button. Then, the application will retrieve the lost or forgotten Outlook email passwords in a wink. Download trial version of CrackPDF Outlook Password Recovery, then install it on your computer. Start the recovery by clicking the Search button. There are two Search buttons in the interface of the application. You can click either of them to find back the outlook password. A seconds later, you will see the server addresses, login email names, login email passwords and the server type in the “Account Information” table. Moreover, you can know the start time and finish time of the process in the “Log Window”. Note: The trial version can only be used free for 20 times. In addition, if you use the trial version to retrieve Outlook passwords, the trial version may not show full passwords. Only the first or the last elements in each password will be displayed. Just one click, you can recover the password for MS Outlook email! 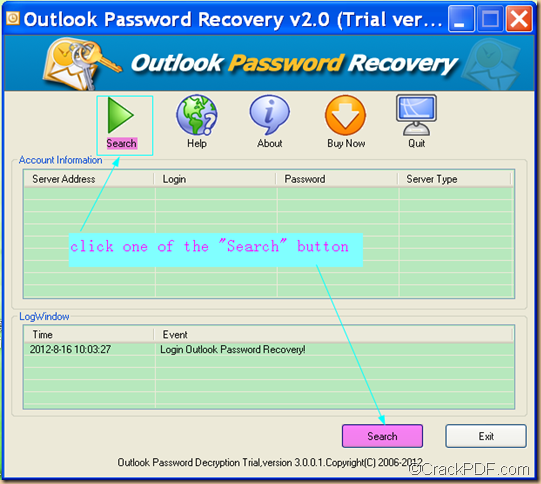 If you want to try CrackPDF Outlook Password Recovery by yourself, please click .